I have seen a number of questions on the SBS Essentials forum relating to setting up domains and SSL certificates on SBS 2011 Essentials. 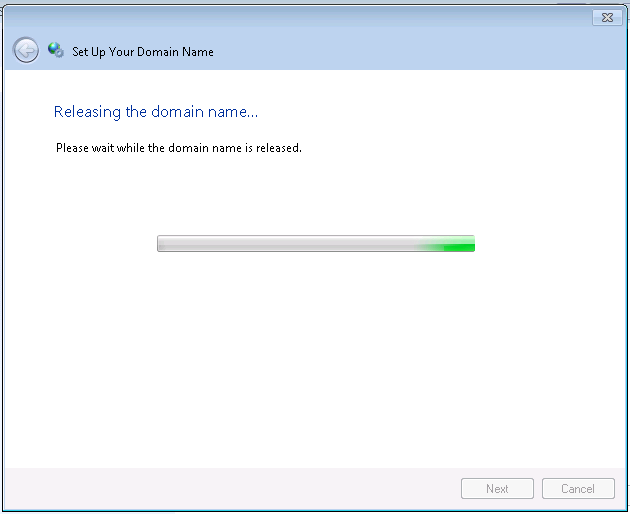 I hadn’t run through this procedure fully as i did not have any domains hosted on one of the supported registrars, so i decided to bite the bullet and buy one. 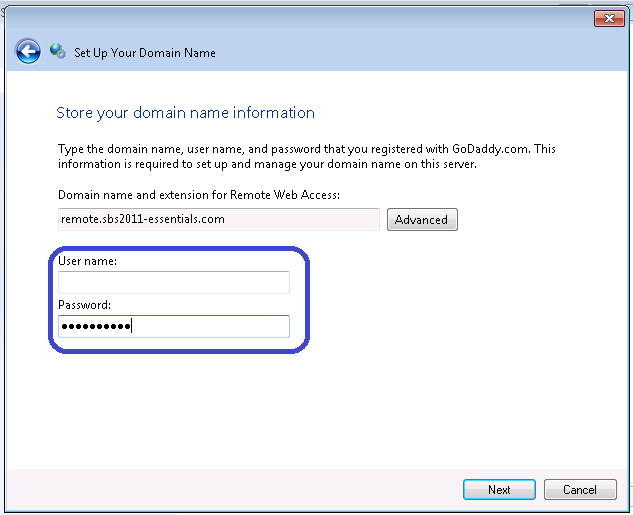 SBS2011-Essentials.com is now mine, and i registered it with GoDaddy – directly on there website, not using the SBS Essentials ‘Setup Domain Wizard’ i chose to do that because i am thinking most people will already have a domain name they want to use. 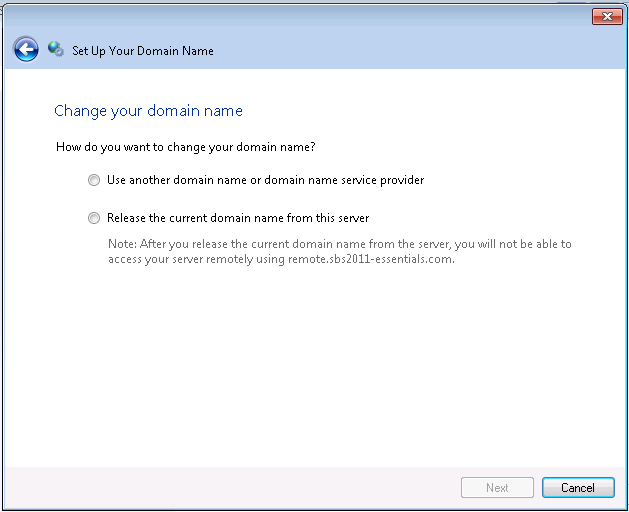 Now my domain is all up and running i can use the Setup Domain Wizard on the SBS Essentials server to configure my server to use this domain for remote access. I have two choices here, i can either run this from my workstation, or i can logon to the server console directly to do it. I am going to run mine from the server console, just because i think most people will be doing that. 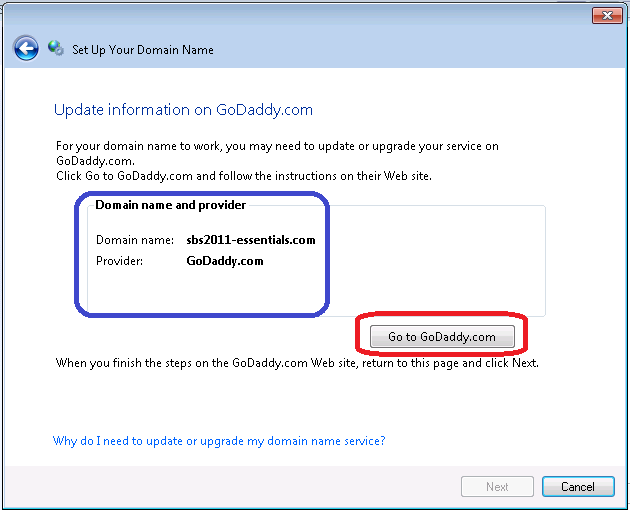 Secondly, if you are using GoDaddy.com, make sure to add *.godaddy.com to your trusted sites in Internet Explorer (i didnt do this to start with and had a lot of trouble with the website) I also changed my Trusted Sites security level to Medium-Low for this task. 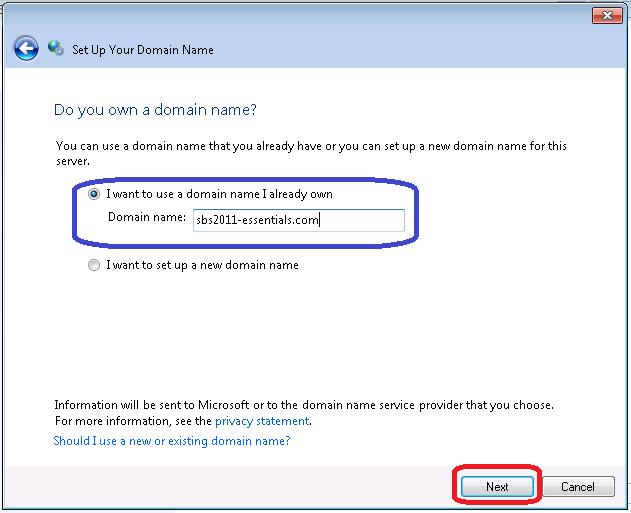 You will be asked if you already have a domain name, or if you want to setup a new one. I have one i want to use so that is what i choose. 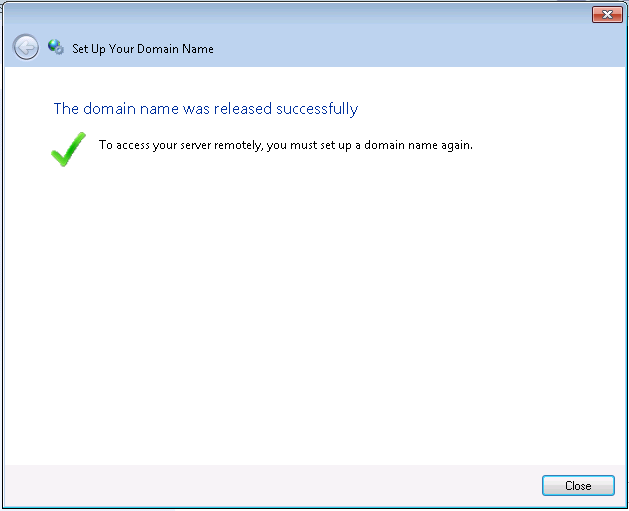 The wizard will lookup your domain name to see if it’s hosted with one of the two current supported registrars – GoDaddy or Enom. If it is detected you will be prompted to go to their site to purchase an SSL certificate, if not you’re asked if you want to transfer it, or setup manually. So anyway, let’s assume it was detected at GoDaddy and you go to their site. If you havent followed my advice above you will have to do so now, adding the site to trusted sites etc to get the GoDaddy website to function correctly. You will also have to close the windows and open it up again ‘As Administrator’ I don’t know why this could not have been coded up to do that for you, but there you go. 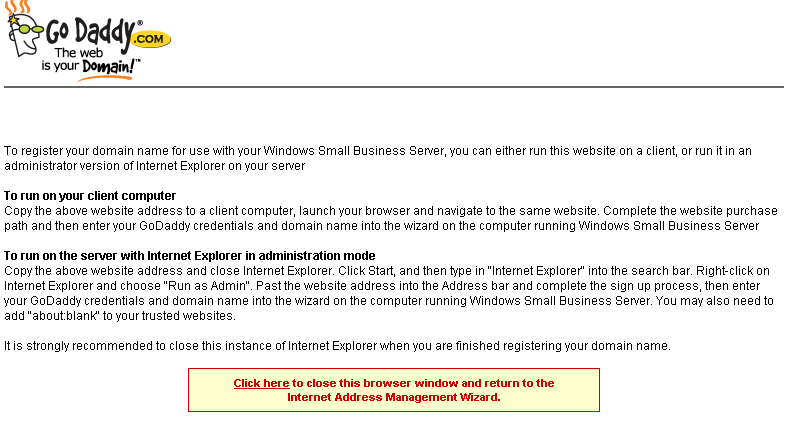 So copy the URL from the IE address bar, and then launch IE as administrator. When the IE window opens, paste the address into the address bar. You will now be prompted for your credentials. When you login you are presented with a few options. Choose whichever services you want, and go to the checkout. Again, fun and games with the website here for me, it wouldn’t let me ‘checkout’ unless i selected an additional service, or chose to have the SSL for more than one year. You can choose whatever you like here to get to the checkout/basket then simply remove the items you don’t want. Continue on to the checkout and pay for your items. Now you can close out, and go back to your wizard. You will be prompted for the credentials of your GoDaddy account. I was expecting this to be the end of the process, unfortunately not. At this point – i broke things. Being the impatient person i am, i wanted to hurry things along, so i logged into the GoDaddy site and managed to ‘use’ my SSL credit. This is normal procedure for SSL purchases with GoDaddy, however you must not do this with SBS Essentials. I am informed by Sean Daniel of Microsoft who helped me with this process, and also his contacts at GoDaddy that basically i broke things, which is why my SSL purchase failed. Having said that, SBS Essentials did not tell me any of that it sat there quite happily waiting for a certificate to be issued by GoDaddy, which was never ever going to happen. I gave it aproximatley 48 hours as well. I am told however, that if i had not done this, it would have worked. If you do find yourself in that situation the only resolution is to get support to refund your SSL purchase or, go through the SSL Install manually. I chose a refund and this i have to say was very easy and their support staff were both charming and efficient. So anyway, being the kind of guy i am , i thought OK, well lets have another go. This also proved to be a bad idea. It seems that either my server, or my domain name are now stuck in some sort of crazy loop, where i am unable to purchase an SSL using the Wizard. Not to worry, i am an uber rich MVP who has money to burn, and time to test the latest and greatest Microsoft has to offer, ill buy another domain name and another SSL. This time i turned to eNom. 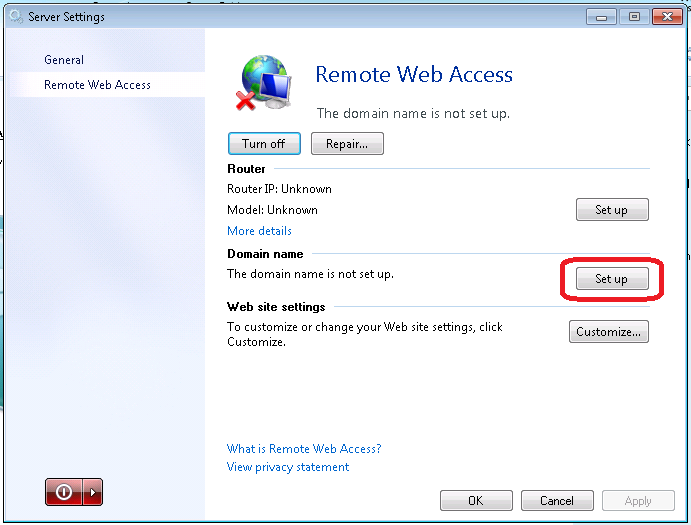 it is relatively easy to remove any domain name from SBS Essentials, you just click Setup, from Server Settings/Remote Access, and follow the wizard to remove the domain name. 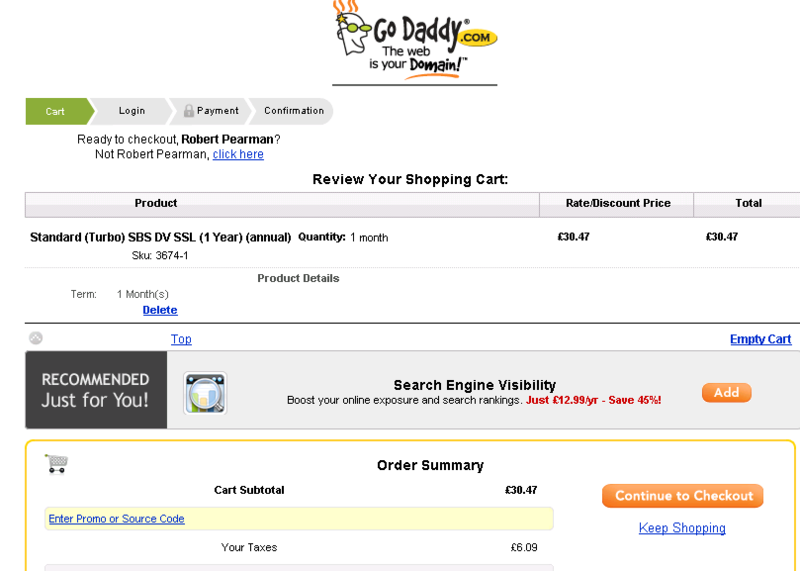 I used the wizard to purchase a Standard SSL from GoDaddy. 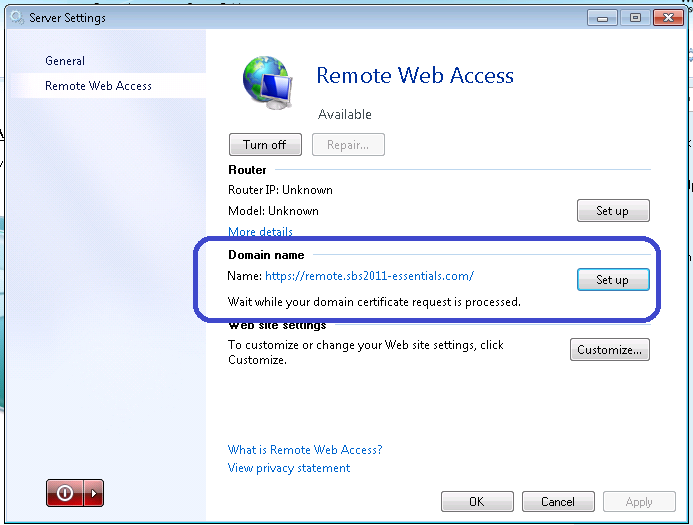 Remote access is working sort of OK. Everything on the remote PC goes fine until it begins to connect and I get an error saying that this certificate is not from a trusted source. I go ahead anyway and connect fine. It would be nice if that “not from a trusted source” would not come up. Did I miss a step? 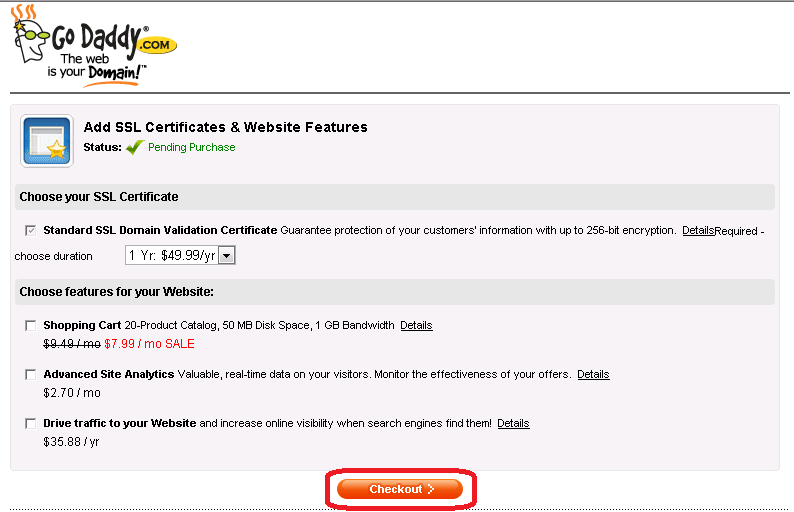 GoDaddy assures me their certificates are trusted. Sounds as though it may not have installed correctly and you have the self signed certificate still installed. What is your public URL? You can email it to me if you prefer not to comment it. 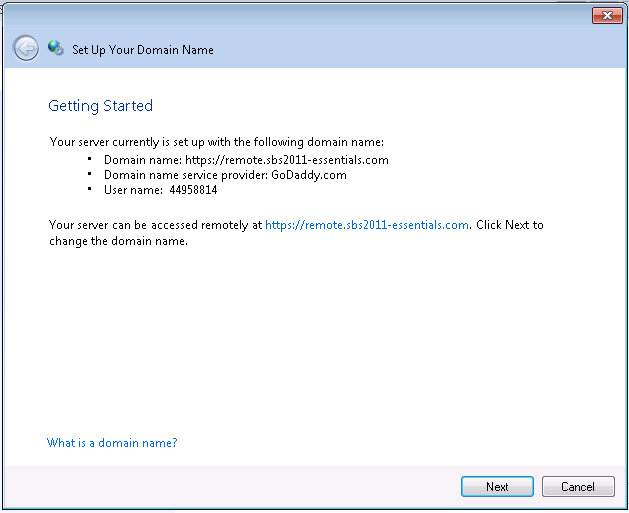 My domain is not at GoDaddy but is at Network Solutions. do you have any instructions for doing this with a different registrar. At this point, when I try to “verify” the certificate with network solutions, I transmit the SBS2011 Essentials generated CSR to them and I get an error of “Invalid Organization Name”. 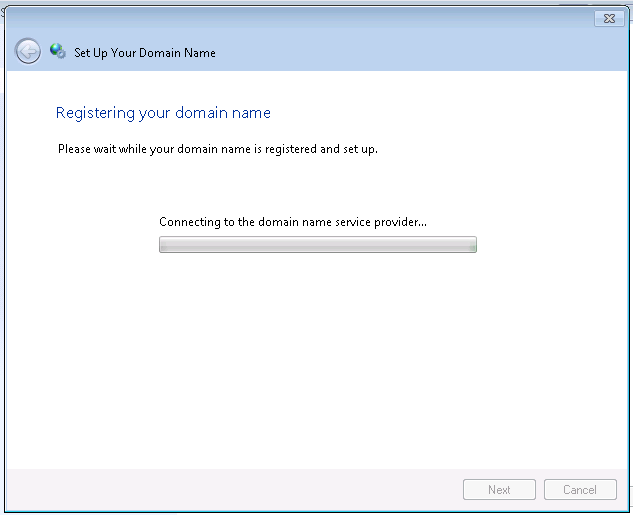 Network Solutions tells me that the Organization Name must match the Registrar’s Name in the WhoIs record. How can I verify that the CSR is putting encoding the correct Organization Name? I would be tempted to ignore the wizard for the ssl creation. 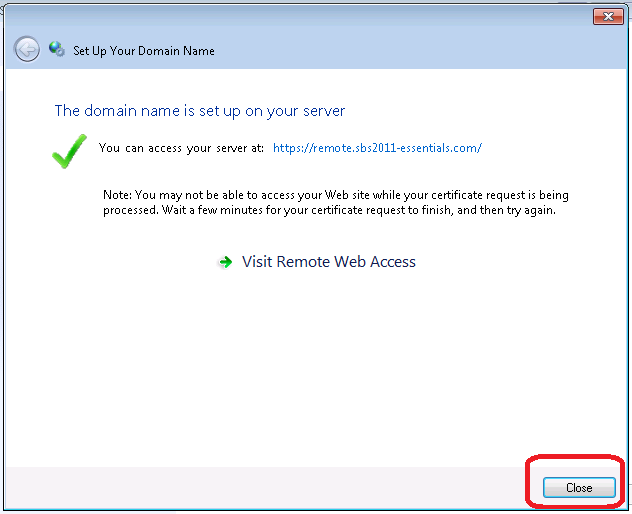 Build the CSR directly in IIS, submit to your CA get the cert back, then go back to the wizard and use an existing ssl. You’re truly a just right webmaster. The site loading speed is incredible. It kind of feels that you are doing any unique trick. Furthermore, The contents are masterwork. you have done a wonderful activity on this topic! This is totally a spam comment, it just made me laugh.